Reminder — as you’ve seen over the past 2 weeks, the ever-changing winter weather can necessitate last-minute changes to the service schedule, so please check your emails Sat afternoons for any weather-related updates. For those of you travelling over the next few days, be safe! Due to the freezing rain forecast for Sunday, Fr Vladimir will not be coming in this weekend. Due to the weather forecast, Fr. Vladimir will not be coming this weekend. Confessions originally scheduled for today will be heard next Saturday. Request for Russian-language reading materials: We have received a request from a chaplain at Springhill prison who’s looking for Russian-language reading materials for a long-term prisoner. If you have books or magazines to contribute, please let Nancy know. They do not need to be exclusively religious, but they do need to be suitable as a donation from a church. As they can only accept a limited number of books at a time, we’re only looking for a small number right now. Parish celebreation of the Feast of the Entrance of the Theotokos in the Temple will be celebrated on the weekend. The feast of the Entrance is the anniversary of Fr. Vladimir’s ordination to the priesthood. This year we mark his 20 years in the priesthood. God grant you many years Father! Reminder: Please sign up to take a turn hosting coffee hour. Confessions: This is an important part of preparing for Nativity. Please contact Fr. Vladimir to schedule an appointment. Confessions are heard Saturdays before Vespers. For those from outside of Halifax, please contact Father to discuss alternate arrangements. Bottle drive: we are continuing to collect recyclables as a fundraiser. You can either bring recyclables to church (please rinse and remove caps), or make the return yourself and place in the offering basket (please label ’recycling’ so we can track it). The appeal for the Philippines was very successful, and while we should not congratulate ourselves on being “good”, we can at least be thankful that the Lord led us to the point of having the privilege of extending compassion to our brothers and sisters in their time of loss and disaster. The sum of $630 was collected in the basket, and then an outsider matched that with another $630. So St. Vladimir’s is able to contribute $1260. Let’s not boast, but pray that the Lord will use our contribution to bring some relief in this very difficult time, and be thankful that we have had the opportunity to serve. I would also remind you that the Feast of the Nativity is quickly approaching... only five weeks away. This is a very important time in the life of the Church, for it marks the beginning of the time when God is truly Immanuel, “God is with us.” In the Incarnation of Christ, the Messiah, the Anointed, humanity is raised up to new levels and to a new dignity. Christ will be born in Bethlehem, not simple a reminder of a historical even of 2,000 years ago, but the reality of an eternal event. The historical Bethlehem is a town in Israel-Palestine, but the absolutely real Bethlehem is everywhere where even a handful of Christians celebrate and proclaim the birth of Christ. We must strive to do all that is within our ower to prepare ourselves for this event, for in it we — each one of us — are given a whole new being... but we must be ready and willing to accept it. God does not impose Himself; we must open to the way to Him. Therefore, you are very strongly urged to begin the Nativity Lent with confessions. Those who have not yet done so, please sign up as soon as possible. Opportunity for confession will be available this Saturday from about 5:00 p.m. onwards. Please, do not be lax. ome to receive the sacrament of Penance and begin the Fast with a pure heart and cnscience, and above all with joy. This Sunday a special collection will be taken to assist those affected by the devasting hurricane in the Phillipines. Please give consideration to how you might help in this time of great need. Coffee Hour: A new sign-up is posted on the bulletin board, please sign up for a turn at providing a light lunch. Nativity Fast: Starts this Thursday. If you have questions about fasting, please speak to Father Vladimir. In addition to fasting, we prepare for the Feast of the Nativity by confession. To book a time for confession, please contact Father Vladimir. Please pray for those suffering in the Philippines in this time of disaster. A special offering will be collected in 2 weeks, more information will come. Confessions: Heard Saturdays before Vespers. Please make an appointment with Father Vladimir. The Nativity Fast is approaching, and confession is a part of our preparation of the feast of the Nativity of our Lord. Fr Vladimir has bronchitis and will not be coming this weekend. We’ll have readers services instead at the usual times. Please remember that this Sunday, November 10th, we will have a mini Christmas sale right after the service at the church. Do your Christmas shopping early and help fundraising for the Capital Campaign (20% of proceeds will go toward the fund)! There is a sign-up sheet on the bulletin board for clean-up tasks. For each task, we are looking for a primary person to take responsibility and an alternate. Confessions are an important part of one’s spiritual life. Confessions are heard Sat afternoon before Vespers. Those from out of town might be able to make other arrangements. Please contact Father Vladimir to schedule a time. Thanks to all who participated in Saturday’s work bee. Your work is very appreciated! Confessions: Saturdays before Vespers. For those living out of town, other arrangements can be made. Please contact Father Vladimir to schedule a time. Follow up to business meeting: Thanks to all who attended. The proposed slate for parish council was elected. We are still awaiting news on the lease, so at some point, there’ll be a meeting to conclude that discussion. A work party will be held on Saturday, November 2nd, from 10am to 2pm to improve our church’s energy efficiency in preparation for winter and to complete some general yard maintenance. All are encouraged to pitch in! 1 other blow dryer will be needed. If you can provide, please let Luke Pittman know. general clean-up including lampadas etc. In the case of rain, indoor work will still proceed, but outdoor work will be postponed to: Saturday, November 9, 10-2pm. Reminder — there are sign up sheets for coffee hour, dishwashing and church cleaning on the bulletin board. Please sign up and take a turn completing these important tasks. Annual business meeting will take place Sun Oct 27 after Liturgy. Though it appears that the lease won’t be ready, we will proceed with the meeting, as there is other important business to discuss. The slate proposed for parish council is as follows: President — Leslee Mansour; Vice-President: Denys Khaperskyy; Treasurer — Ksenai Treiger; Secretary — Jennie Strochuk; Member-at-large: Alina Kirsanova. Further nominations can be proposed. And now for some really, really exciting news — We’re gonna have a deacon! It was announced on Sunday that our dear Sasha Treiger will be ordained to the diaconate at the Feast of the Theophany. This is a tremendous blessing for our parish. Please keep our future Fr. Deacon and Matushka in your prayers as they prepare to take on this great responsibility. Vespers for Wed Sept 25 is cancelled. Also, don’t forget about the yard sale: Sat Sept 21 at the Pitmans, 2690 Fuller Terrace Hours: 9-2 pm. We need help bringing items over from church Fri evening or early Sat morning, perhaps some help during the sale, and clean up and disposal afterwards. If you can volunteer, please advise Nancy Rogers. This weekend, we’ll be celebrating the Nativity of the Mother of God. At a minimum there will be readers Vespers Sat at 6:00 pm and Typika Sun at 10:00 am, but we’re hoping that Fr Vladimir will be well enough to travel. Please continue to pray for his recovery. We will have readers services this weekend at the usual times (6:00 pm Sat, 10:00 am Sunday). Please continue to pray for Fr Vladimir’s recovery. At a minimum there will be readers services at the usual times (6:00 pm Sat, 10:00 am Sunday). If Father is feeling sufficiently well later in the week, he’ll come in to celebrate services. Stay tuned for updates. We’re going to have readers services this weekend. Fr. Vladimir would dearly love to be there to celebrate Dormition with us but he had a car accident after leaving church last week and is still recuperating. He will be OK, but his ribs took a pounding from the seat belt and as you can imagine, it’s painful. We’re thankful it wasn’t more serious, please pray for Father’s speedy recovery. The Church has given us tools for worship when a priest is not available, so please join us as we celebrate one of the great feasts of the Church. The tomb and epitaphios will be set up for veneration. To make an appointment for confession, please contact Fr. Vladimir. This is a new and exciting chapter for James Neish. As many of you know, James soon begins his journey to Peterborough, Ontario for school (he leaves August 19). This Sunday during coffee hour we will have a potluck going away party at the church. Please bring something yummy to share as we send James off! Due to the anticipated rainfall for tomorrow (Saturday) it has been decided to postpone the yard sale. The Transfiguration of Our Lord will be celebrated on Sun. Aug. 18. The Dormition of our Most Holy Lady Theotokos will be celebrated on Sun. Sept 1. Yard Sale — due to damp conditions in the basement for storing items, it has been determined that it would be best to have the yard sale sooner rather than later. We will have the yard sale Sat Aug 10 at the Pitmans — 2690 Fuller Terrace (off of North Street), from 9 am to 2 pm (set up starting at 8). We do have some volunteers already mobilized, but we could use a few additional helpers on Sat itself (even if not for the entire time), and Friday Aug 9 to transport items from the church to the Pitmans (timing to be confirmed). If you can assist, please let Nancy know when you’re available to help. Important reminder — as mentioned at the parish business meeting, if you have any questions or concerns about the proposed lease, please send them as soon as possible to Sasha Treiger, who’ll arrange to share with the parish council and to seek a legal opinion. Fundraising: we are collecting recyclables. Please bring your empties (rinsed out, please) to church. Nancy and Therese will bring them to a depot for refund. Luke (our totally awesome resident handyman) has compiled a list of tasks that need to be done tomorrow. If you’re available, please come tomorrow afternoon to help. Work bee starts at 1:00 pm. There is much to do in the basement but not much room for many bodies. The re-organization of the synaxis room, kitchen and storage areas will have to be a very focused effort for a few people who can lug a lot of stuff from there to here and here to there. The synaxis room needs to be cleared out, and it would be a good time to price some yard sale items. The pews need to be completely reorganized. The kitchen could be organized better and cleaned. The grass could be cut in the cemetery and church yard. The church has a mower and gasoline but is in need of a grass trimmer (even brought from home to use once would be helpful). Mowing the whole place takes about 3 hours. The bushes in the ditch need to be cut back, making the driveway more visible. Anyone with branch cutters is encouraged to bring them. The branches and bushes all around the cemetery are getting unruly and the cemetery is shrinking. These can be trimmed back as well. Apart from mowing and trimming the grass in the cemetery, sticks and rocks can be collected and thrown into the woods (good job for kids). Another task for anyone who wants to make every small action count, young and old, it takes as little as 5 minutes: it is a good idea and a labour of love to simply brush off dead grass from a gravestone, to tidy them up a bit. Nothing invasive, just bend down and brush it off, pick a few weeds, pick up some fake flower petals that have become detached, etc. Anyone can do this at any time, by the way. Maybe care for a grave on your way to the car after a service or whatever. I find spending time in the cemetery reminds us to think of death, to pray for reposed loved ones and also to connect with the Anglican Christians in the area, whose church property we share. If anyone is really keen, the windows could be washed. General tidying up around the property and inside the church. Hours and Divine Liturgy followed by potluck parish picnic at Fr. Vladimir’s in New Germany, at 10:30 am. If you need a lift, let Nancy know, and she’ll try to match you up with a vehicle with room. God grant many years to Myshko Khaperska on the occasion of his baptism and chrismation! Please send any questions or concerns about the proposed lease to Sasha Treiger, who will arrange a legal appointment. 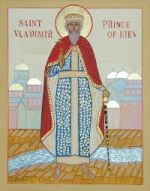 Sun July 28 — our patronal feast (St. Vladimir, Prince of Kiev) will take place at Fr. Vladimir’s residence near New Germany. Liturgy will begin at 10:30 am, followed by a potluck dinner. Any parishioners who have questions about the lease to be signed with the Anglicans are to write them down and send them within 2 weeks to Sasha. Sasha will take them to a lawyer for examination and clarification. It was resolved that a building inspector should be called in as soon as possible. Ksenia will look after this. The need for renewed fundraising efforts was mentioned. To be able to cover operating costs of a rental property, or to save towards a purchase of a permanent church home, we must raise funds. Any suggestions for fundraisers should be sent to Nancy. Our capital campaign fund currently stands at just over $12000. A fundraiser of collecting bottles was decided upon, to begin immediately. For information please contact Therese and/or Nancy. Parishioners are requested to begin bringing to church their clean (please rinse them out! ), recyclable bottles (glass, plastic) which will be taken to a recycling center for a refund. The parish garage sale will take place sometime at the beginning of September. Sat July 6 — Baptism of Petra Hamm 1:00 pm. All are welcomed to attend. As per our parish bylaws, there will be a final announcement on Sunday July 7, 2013 about the General Parish Meeting on July 14 concerning the lease from the Anglican Diocese for the use of our current worship space. Hard copies will be available at church this Sunday, as well as Membership Forms for any new members. Any questions in regard to membership should be directed to the parish council (Luke, Alina, Leslee, Ksenia) Please make every effort to attend this important meeting. We have received the lease document for the building we’re occupying from the Anglican Diocese, and we require parish approval to accept it. The lease will be posted on the parish bulletin board for review, and fundraising will be discussed as well. Please make every effort to attend this important meeting to discuss the future of our parish. Note that the yard sale will be postponed to later in the summer. As many of you know, the Iremadze family will soon embark on a new adventure, moving to Calgary. On Sunday, June 23rd at 3:00 pm we will have a potluck at the Treigers to say our goodbyes, thank them for their contributions to the life of our parish, and send them off with our best wishes. Please join us! Fr. Vladimir is back from vacation, but he has a broken arm and will not be able to serve Liturgy this weekend. This weekend the Saturday evening Vespers (June 8) is cancelled, but on Sunday, June 9 there will be a Readers service at 10 a.m.
On Wednesday evening (June 12) at 6 p.m. Fr. Vladimir will be present for the Feast of the Ascension and will serve Vespers followed by Liturgy, but he will not be able to hear any confessions. Further notice about the weekend of June 15-16 will be sent out by email. Depending on how fast Father’s arm heals, and when the cast can be safely removed, future services will be announced. We wish Father a belated Happy Birthday (on May 22) and a speedy recovery, and Many Years also. We hope that he will soon be back in our midst! Parish fundraiser — our flea-market will be June 22. In addition to raising funds, this will also serve as our introduction to the neighbourhood. Everyone’s help is needed to make this a success! Please bring items, already priced to church, they can be stored in the basement. We’re also looking for some baked goods and plants to sell. Help will be needed for set up and the day of the sale itself. If you’re able to help, please let me know. There’s a lot of work to do to accomplish our goal of purchasing our own building! (Note that Fr Vladimir is away for the next 3 weekends, but we’ll have readers services while he’s away). Thank you to all who helped ensure our Holy Week services went ahead as planned: to Father Vladimir, of course, for his faithful service; our altar servers, choir, those who directed parking, set up the tomb, cleaned, baked prosphora, set up the basement, hosted the Paschal meal the next day, etc. Thanks for all your work! Please remember in your prayers the abducted Syrian bishops, that they may be soon released. Holy Week is now well underway. This is the most sacred of the year as we participate in the events of Christ’s passion and Resurrection. To fully enter the joy of Pascha, we need to prepare ourselves, and the Church has given us various services to help us do so. Sat., Apr. 27 (Lazarus Saturday)10:00 a.m. Liturgy of St John Chrysostom; Vigil of Palm Sunday 6:00 p.m. Sun., Apr. 28 (Palm Sunday)10:00 a.m.: Hours, Divine Liturgy 10:00 a.m; Bridegroom Matins 7:00 p.m. Mon., Apr. 29 Bridegroom Matins 7:00 p.m. Tue., Apr. 30 Bridegroom Matins 7:00 p.m.
Wed., May 1 Service of Anointing 7:00 p.m. Thur., May 2 Hours and Liturgy (Commemoration of Last Supper 10:30 a.m.; The Twelve Passion Gospels 7:00 p.m.
Fri., May 3 (Great and Holy Friday) Vespers 2:00 p.m.; Lamentations 7:00 p.m. Sat., May 4 Paschal Vigil 11:00 p.m. Sun., May 5 Paschal Social 3:00 p.m.
Confessions: There are many who’ve yet to make an appointment for confession, and time is running out. Please note that a lenten confession MUST be made in order to receive communion at Pascha. Please email or call Fr. Vladimir (483-7492) as soon as possible. Friday is the last possible day for Father to hear confessions. There will be no confessions heard on Holy Saturday. Parking: Parking at church is severely limited. We encourage you to park on Fergusons Cove Rd and leave parking at the church for the elderly, mobility impaired and families with young children. Latecomers — note that there will be a procession and gospel reading outside. Use extreme caution in attempting to enter the driveway and please obey instructions to park on the street. We need some volunteers to help manage and direct parking. If you can be at church for 10:30pm and can help, please contact Alina at 830-7803, and she’ll provide instructions. Paschal meal: after the Liturgy, there will be fellowship downstairs, with simple finger foods and items from Paschal baskets. The main meal will take place at Sasha and Ksenia’s house Sun 3-6 p.m. The signup sheet for the potluck is located at the church bulletin board (in the entrance area, just by the door to enter the nave). A note about this weekend: His Grace, Bishop Irene’e will be present to ordain Dn John Palmer to the priesthood to serve in the parish in St. John’s. After Liturgy, an informal reception will take place at 16 Pottery Lane (where Fr Vladimir’s birthday celebration was held) from 1-3 pm). Since street parking is limited, carpooling from Church to the site is suggested. It is off of Battery Drive, very near to the church. As this visit is to conduct Archdiocese business rather than a parish visit, we won’t have the opportunity to organize the types of activities that would normally take place on such an occasion. Reminder: There is not much time left for Lenten confessions. Please make an appointment with Father Vladimir. This coming Sunday, April 7, is an extremely important Sunday: the Adoration of the Holy Cross, and the Annunciation. Confessions are available throughout Lent on Wednesdays from 4:00 to 5:30, and on Saturdays from 4:00 to 6:00. Lenten Confessions — As part of the preparation for Pascha, confession is necessary. Father Vladimir encourages a confession early in Lent as a way to help us through the Fast. Please schedule a time. Please consult Father Vladimir if you have any questions about establishing a fasting discipline. The normal time for confession is Saturday afternoon between 4:00 and 6:00 p.m. Requests for confession must be made no later than 6:00 p.m. on Friday by e-mail or by telephone. E-mails sent after this time probably will not even be seen, and telephone calls may not be answered. Confession cannot be done on Sunday mornings before Liturgy. One major thank you that was missed on Sunday was thanking the New Home Search Committee: David, Alina, Luke, Elena, and Andre. David and Alina especially worked tireless hours networking, researching, crunching numbers, meeting with real estate agents, relaying information back to the council and parish. It was through their work that opened the opportunity to move to our new location. Father mentions that this new temple is a miracle. And God worked this miracle through the hard work of this committee. Thank you David, Alina and gang! This Saturday, the last Saturday before Lent, will be the last opportunity for people to make pre-Lenten confession. Confession is an ideal way of preparing to enter the Great Lent, and it fits well with the ceremony of mutual forgiveness which will take place this Sunday after the Liturgy and Forgiveness Vespers. Sat Mar 9: Baptism of Emelia Petronella 3:30 pm; Vespers 6:00 pm. Note that clocks go forward one hour this night. Let’s celebrate this major milestone in life of our parish. Let’s thank all those who helped. When: After Liturgy on Sunday, March 10. All invited. Those who helped with the move, attendance is mandatory (how else are we going to thank you?). We moved and even though we are still settling in, and everything is not quite in the right place yet, it is important to stop to reflect upon the many graces we have received. NOTE: This is also meat-fare Sunday, the last time to eat meat before Pascha. Therefore, let’s make this potluck extra special. We’ve had our first full weekend of services in our new location! This weekend also marked Juliana’s return after giving birth to little Emelia. Please keep the Pitmans in prayer as they adjust to life with 2 little ones and prepare for Emelia’s baptism. This week is a fast-free week. Yay! Start using up the meat and diary products in your freezer — only 3 weeks to go until Lent begins! Coffee hour: a new sign-up sheet has been posted in the vestible, please take a turn to supply a main dish. Everyone is encouraged to bring side dishes, desserts, etc even when it’s not your turn. Glory to God, we’ll have our first liturgy in our new location on Sunday, February 17!! At 10 am, we’ll have the blessing of the church, followed by the hours and Divine Liturgy for the Meeting of Lord. Please join us for this celebration. For coffee hour, note that we only have a microwave, please keep this in mind in planning what food to bring to church. In addition to the parking lot, there is some street parking available on Purcells Cove Rd and Fergusons Cove Rd, just across from the church. If you’re considering making a purchase or donating an item to help set up our new space, please check with Ksenia Treiger before doing so in order to ensure we have have what is truly needed. This will allow your gift to make the best possible impact. Please don’t forget about our capital campaign!! We’re not yet able to say that we’re in our “forever” home, and we won’t have a permanent home without your help! Thank you to all who’ve helped over the past several weeks with packing, moving, cleaning,unpacking and setting up. A special shout out is due to our resident carpenter, Luke Pitman. Whatever would we do without him? Note that Vespers will now be at 6:00 pm. Due to the weather, Father Vladimir will not be travelling today, so there won’t be any services tomorrow. Hopefully next Sat afternoon or evening we’ll be able to tell you that we’re ready for Liturgy on Sunday. Please check your email late Saturday for updates. Many thanks to everyone for all the hard work — both past and ongoing — in moving into the new St. Vladimir’s, 629 Purcell’s Cove Rd. This coming Saturday, Feb 9, we would like to try to get all the basic essentials done, and hopefully, the iconostasis and the altar area should be in place by the end of the day. It is necessary that everything be done in an organized and orderly manner. Luke Pitman will be in charge of assigning different tasks to the appropriate groups so as to prevent people from working at cross-purposes. We ask people not to take any initiatives unless they are approved by Luke and/or Fr.Vladimir, so that the ordering of the church will be consistent. Also, anyone who wants to donate, bring or buy anything for use in the new home must contact Ksenia Pychko for approval. In this way we will avoid duplicates or unnecessary items being brought in, and Ksenia will be able to keep our expenses from getting out of hand. Please note also that the first service to be held in the new St Vladimir’s will be a Liturgy preceded by a brief blessing of the worship space. This will take place either this Sunday morning (if everything is ready) or the following Sunday, Feb. 17. Before this, no services may be held in the church. The blessing and Liturgy will set the church aside as a legitimate place of Orthodox worship. The parish website has been updated with directions to the new church, times of services, and other important information about our new home. Please note that the time for Vespers has been changed to 6 p.m.
Let us all be thankful to the Lord for the tremendous blessing of finding a suitable home and continue to work together in peace and joy. Sat Feb 2 — Today very much was accomplished. We have completely moved out of our old location, and have moved everything to the new to the former St. Philips. Set up at our new location has begun. Thank you so much for all that have come out to help today. Your help is so much appreciated. If you are coming to help or view the new temple on Sunday, Feb. 3, please come to the new St. Vladimir’s Orthodox Church at 629 Purcell’s Cove Rd. Plan of Action for Sunday, Feb. 3. No liturgy. We are still unpacking. Some will attend Divine Liturgy at another Orthodox Church. 10:20am Those wanting to be present for thank you gift presentation to St. George’s Anglican meet at St. George’s Anglican Round Church. 9:30am-Afternoon — St. Vladimir’s (629 Purcell’s Cove Rd.) will be open for unpacking and setting up. For those who signed up to help with the unpacking, you may arrive after that time. This weekend will be the last full weekend of services at our current location. After Liturgy Jan 27 there will be an important parish meeting to provide an update of the situation regarding the possible rental for one year of St. Phillip’s Anglican Church at 629 Purcell’s Cove Rd. We are hopeful that all should be coming together to enable us to move directly to our new location. Please make every effort to be present at this key meeting to discuss our next steps. We have a new parishioner! Emelia Petronella arrived Monday evening, January 14, weighing 7 lbs 4 oz. Mom and baby are well, and Simon is a very good big brother to his new sister! Wed Jan 16: St. Antonios’ feast day will be celebrated at 7pm with a liturgy and an agape meal. Bp Alexander will celebrate. And we’re in desperate need of boxes! If you can, please bring some this weekend as we’re packing up the library. If you have library books at home, please bring them back so we can track where everything is. Juliana and baby as she enters the final weeks (or days?) of her pregnancy. Christ is born, glorify Him! Christ comes from heaven, meet Him! Christ is on earth, be exalted! O all the earth, sing to the Lord, and praise Him in gladness, O ye people, for He has been glorified. Please note confession will be required before Communion on the Nativity. Sunday, January 6, after the Royal Hours and into early afternoon. There will be no opportunity for confessions before the start of the vigil. After the Nativity Liturgy on the evening of January 6, there will be a potluck dinner in St. George’s Church Hall. It will be greatly appreciated if everyone could contribute something, whether it be meat, fish, salad, cheese and crackers, dessert or beverages. Due to the ongoing renovations in the hall, we’re not sure what state the upstairs kitchen will be in and whether we’ll have access to it, or if we’ll need to make do with our stove and microwave for reheating food. Please keep this in mind when planning what to bring. You may wish to bring any hot foods in a crock pot. For those who were absent from liturgy on Sunday, you missed the latest news on our fundraising efforts for the Capital Campaign: we’ve broken the $10 000.00 mark!! Way to go everyone — keep up the good work! Many thanks to all who’ve pledged and contributed so far. This weekend, a group from the parish prepared and sold baked goods at the Russian night event, and sold leftovers at the church, raising over $250. Thanks to all who helped out! Please continue to pray for our parish, our priest, parish council and new home committee during this time. Hopefully by next week, we’ll have a response from the Anglican diocese in regards to our discussion with Bishop Moxley, and then we must make some decisions.